The real truth is that I am a learning rabbi. I bring information to people, and then we talk and learn things. That’s how Jewish learning works: you begin with some raw material, like a text, you put in on the table among you, and then by pulling and pushing at it, talking and listening, everyone at the table learns. I love learning, so I love my work. What does any of this have to do with Passover? Passover is a learning holiday. 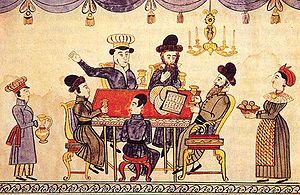 The Passover seder is one of the greatest pedagogical devices in history: it’s been used to build Jewish community and transmit a sense of Jewish peoplehood for close to two thousand years. Once a year, we sit at the table. We bring some raw information: a haggadah, a few songs and stories, our own perceptions and thoughts. If we seize the opportunity to share them, really share them, to pull and push and talk and listen, then we come away from the table with new thoughts, perhaps with new plans. They say that at a certain seder in Bnai Brak in the year 132, five rabbis stayed up all night, moving from discussing the Exodus to planning a revolution. The revolution failed, but we still read about the seder every year at our seders. Maybe they left the table a little too early. Maybe they needed to plan some more. *About that “too hungry to learn” problem: Karpas (the greens on the seder plate) was not meant to be a few strands of parsley wet with salt water. Think of it as a salad course: have a nice salad of lettuce, or endive, or whatever green thing you love to eat. No need to starve on this night of all nights, when we celebrate moving from slavery to freedom!